self-confidence and peace of mind. Dr. Pasqual worked me into his schedule on short notice when I had a tooth causing significant pain. He was able to remove the tooth and place bone in the socket to prepare the area for an implant in the future. His technique and patient care manners are excellent. Dental implants are tiny titanium posts that are surgically placed and aligned in the jawbones of the maxilla or mandible where a tooth would be missing. An implant acts in place of the tooth root. The bone then binds with the titanium implants, creating a strong base for the artificial tooth or crown. Tiny posts that stick out from the gums are then attached to the titanium implants. These implanted posts provide strong anchors for the artificial teeth. Our practice utilizes only premium implants and components. 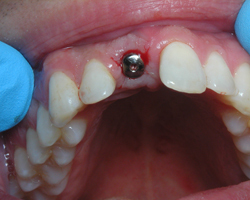 For most patients, the titanium implants can be implanted at the time of the tooth extraction. However, for some patients a second surgical procedure is required when placing the dental implants. For the first three to six months following surgery, the titanium implants are below the surface of the gums integrating with the jawbone. Patients will be able to wear temporary dentures and eat a softer diet during this time period. Once the implant has integrated with the bone, phase two begins. 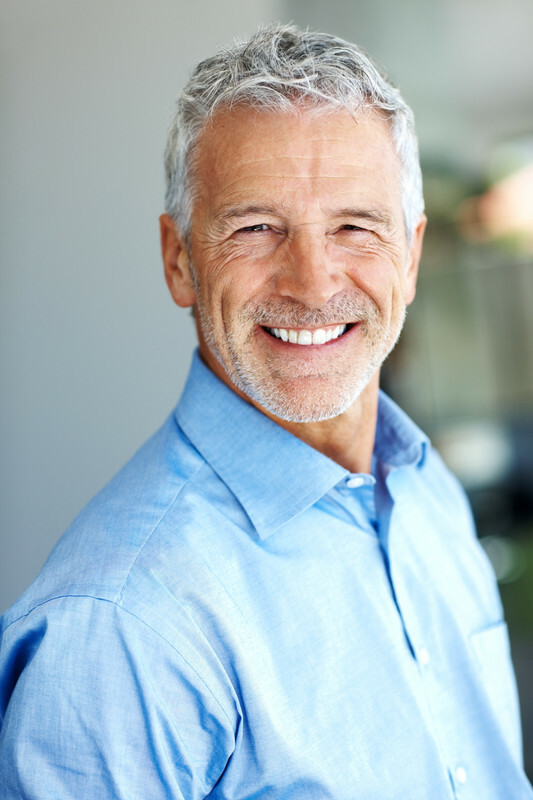 Dr. Pasqual will then uncover the dental implants and then attach a smaller post or abutment that will protrude through the surface of the gums and will act as an anchor for the artificial tooth or crown. Once the artificial tooth is placed, the small posts will not be seen. Most patients will experience minimal to no disruption in their daily lives. 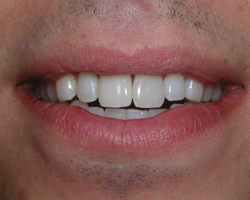 Using the most advanced dental implant technology, Dr. Pasqual will many times be able to place single stage implant. Meaning, the dental implants are placed immediately following tooth extraction. These dental implants will not require more than a single procedure nor will require the implants to be exposed or uncovered when placing the crown. Dental implant placement requires a team approach between an oral and maxillofacial surgeon and a restorative dentist. Dr. Pasqual will perform the implant surgery, dental extractions, and bone grafting where necessary. 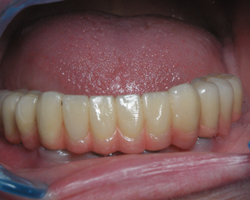 Your restorative dentist will fit and make the permanent prosthesis. Your dentist may also make a temporary prosthesis that will be utilized during the healing phase. A single artificial crown will be used as a replacement for a single missing tooth. Each artificial tooth will attach to its own dental implant. 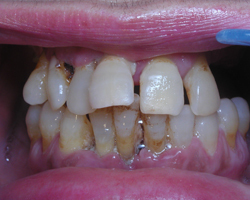 A fixed bridge can be a replacement for two or more missing teeth. 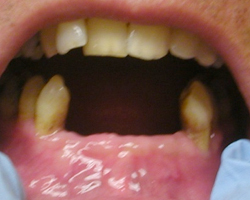 It also may require two or three dental implants. 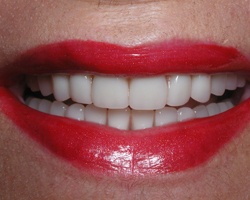 A complete fixed bridge can replace all teeth in the upper or lower jaw. A removable over-denture attaches to a bar or ball-in-socket type attachment, whereas a fixed prosthesis is permanently fixed and can only be removed by the dentist. The number of dental implants will vary depending upon the recommendation from Dr. Pasqual on whether the patient will be in need of a removable or fixed prosthesis. Dr. Pasqual performs in-office dental implant surgery in a hospital-style operating room, therefore producing the highest level of sterility. Inpatient hospital dental implant surgery is only for patients who have certain and special medical or anesthetic needs. An exception for inpatient hospital implants will also be made for those who will need extensive bone grafting from the jaw, tibia, or hip. After hearing about dental implant surgery, you will realize there is no need to sacrifice your quality of life. If a patient loses several teeth in a recent event or has lived without teeth for several years, chances are they will never become fully accustomed to losing a vital part of themselves. Dr. Per-Ingvar Branemark, a Swedish scientist and orthopedic surgeon, invented this technique for oral rehabilitation more than 35 years ago. With his research, Dr. Branemark created a renewed quality of life and self-confidence for millions of people who were facing the frustration and social stigma of tooth loss. For several reasons: Why should you sacrifice the health of the surrounding teeth to bridge a space? In addition, removal of a denture or a “partial’ when the time comes is inconvenient, not to mention the uncomfortable feeling and embarrassment of a denture that slips. When considering implant surgery, the patient’s mouth must be thoroughly examined by Dr. Pasqual and their medical and dental history will be reviewed. If the patient’s mouth does not meet the ideal requirements for dental implants there are ways of improving outcomes, such as bone grafting and soft tissue surgery, which may be recommended by Dr. Pasqual.